Hi and welcome to J M Contractors. We are a registered, family run business that is built on pure reputation and testimonials that can be requested on site. 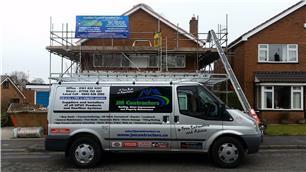 We take absolute pride in all aspects of our work, from full, complete re roofs to general roof repairs, property maintenance and all type of home improvements. Suppliers and installers of UPVC rooflines - fascia - soffits - guttering - downpipes - windows . As a company we can also Jet Pressure Wash your Drives - Paths - Roofs and Brickwork ..
We have you covered and will be most happy to give you a free inspection on any of your concerns. Don’t delay and call today for a free, no obligation quotation. Local contact No : 08456 262585 ..